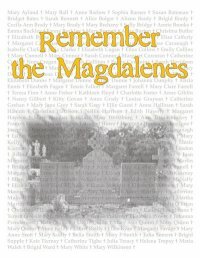 "Justice for Magdalenes (JFM) is a not-for-profit, totally volunteer-run organization, with members in Ireland, the UK, the US, EU and Australia. We are primarily an online community, with a website, a Facebook page, and two listserv discussion groups with over 300 members. We also have non-Internet based members all around Ireland, many of whom are Magdalene survivors. JFM advocates on behalf of a population of women -- living and dead, some still living in religious institutions, others living in anonymity, and many now speaking about their past -- who are not recognized or acknowledged as survivors of institutional abuse by the State, by the Church, or by Irish society. To bring about an official apology from the Irish State and the Catholic Church. The establishment of a distinct redress scheme for Magdalene survivors. Once JFM achieves these objectives, the door will be open to every survivor and/or her family and/or other groups representing Magdalene survivors to pursue their own claim for redress. JFM has both a coordinating committee and an advisory committee. The coordinating committee includes survivors/daughters of Magdalenes as well as activists committed to the ideal of social justice. The advisory committee consists of academics and professionals who provide advice and support but who remain subject to approval by the coordinating committee.